The provincial government is refusing to deny rumours that elements of the Hurontario LRT project are on the verge of being thrown on the scrap heap. NDP transit critic Jessica Bell released a statement late Tuesday in which she said that, during a meeting with ministry of transportation representatives, they refused to dispel concerns that the government planned to cancel both the Peel Region LRT and GO electrification. If the LRT is cancelled, it will break a vital link in Brampton’s transit future. The Doug Ford government, while not confirming the project is being cancelled, has stated it has not made any decision about the future of the LRT in Mississauga and Brampton. That’s in sharp contrast to what Metrolinx officials stated earlier this fall. The new chair of Metrolinx, the provincial agency that oversees transit planning across the Greater Toronto and Hamilton Area, said he did not foresee any major cuts to Metrolinx’s ambitious plan for key regional transit projects. Don Wright, a former executive of TD Securities and the first person to lead the agency in a government not run by the Liberals, pledged in September, shortly after getting the job, that the PC government’s goal of dramatically reducing Ontario’s crippling deficit will not affect needed transit projects across the region. There have been no specific announcements about Brampton’s future priorities and whether they might be in jeopardy, or whether the province will get on board with any new plan the incoming city council led by Patrick Brown might approve. Cancelling the Hurontario LRT, which is planned to run 20 km between Mississauga and Brampton at a cost of $1.5 billion, would be a massive roadblock for the development of higher-order transit in the city. The province also won’t say if it will put back on the table the roughly $300 million pledge for the Brampton portion of the project that the previous Liberal government retracted when council voted down the provincially approved and fully funded Main Street LRT route back in 2015. The Mayor-elect has pledged to support a planning document called the 2040 Vision, including its ambitious ideas for higher-order transit in the city, which the outgoing council adopted as the path forward. The transit issue, simmering for years as a booming population led to increasing traffic congestion, came to a boil three years ago when the LRT route debate focused public consciousness on the city’s transit future. Now, with the municipal election over and a new council, with five new members, set to be sworn in next month, many residents are feeling optimistic. However, key transit decisions, some of which are laid out in the 2040 Vision document, won’t be completed in a vacuum. Brampton will need the province’s help to pay for higher-order transit and to assist in creating transit hubs across a region expected to grow to nearly 2 million people by 2041. That kind of growth will require development of regional express rail, high-speed rail, and other future transit connections. This makes the province’s lack of commitment significantly more troubling for transit advocates. The uncertainty about the province’s approach comes at a critical time for Brampton, as more residents are starting to see the impact of poor transit planning on the city. Nearly a quarter of respondents to a poll commissioned by The Pointer in late August said alleviating traffic congestion across the city needed to be the top priority for the incoming council. Over 60 percent of residents supported bringing LRT into Brampton (though respondents were split on the best route). The largest proportion laid responsibility at the feet of elected officials inside Queen’s Park, with 29 percent blaming the province for underfunding growth across the city. Brown assumes the mayor’s chair at the start of December, bringing with him not only support for the 2040 Vision plan, but also a Brampton-first stance, with a pledge that he would work hard with all levels of government, regardless of who is in charge, to get what is best for Brampton, including big items on the transit file. 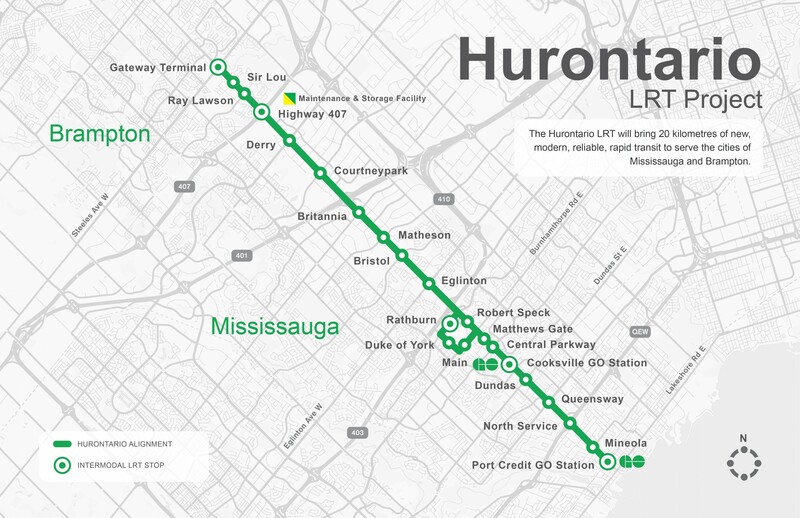 In total, the city had five requests for the province, including hitting fast-forward on the Hurontario LRT extension, seeking a partnership with Metrolinx to advance the environmental assessment on the project to connect the LRT to downtown. Currently, Brampton is working with Metrolinx to incorporate ideas for bringing the LRT to the Brampton Gateway terminal, but provincial funding evaporated after council voted down the Main Street LRT route into downtown. 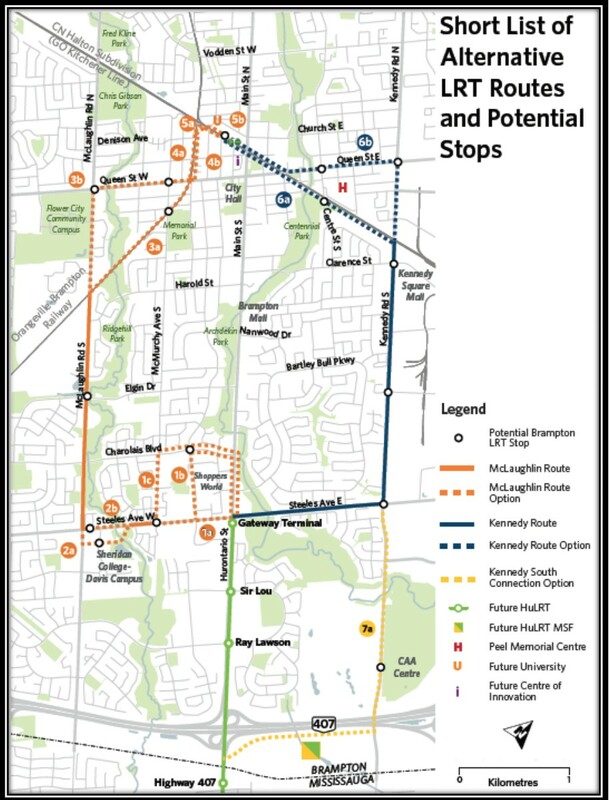 The city has plans already in place, including the current study to determine the best route for the LRT, which is costing Brampton $4.4 million. It’s basically a coin-toss at this point between Kennedy and McLaughlin roads. A decision is critical not only for north-south transit routes but also for creating the ambitious double loop described in the 2040 Vision document, which could be based on either an LRT or a Bus Rapid Transit system. The loop would connect Brampton’s future cultural hubs of downtown and uptown with LRT, BRT, or a combination. The city also wants to create four “mobility hubs” across the city, centred around the Brampton GO station, the Bramalea GO, the Hurontario-Steeles Gateway terminal and the Mount Pleasant GO station. It is looking to the province to support development of these hubs, with preliminary planning already underway for the Bramalea GO hub, including an intensification corridor study. The other asks all have a common goal of connecting Brampton to other portions of the GTA, or making it easier for commuters or travellers to move around and through the city’s main arteries. City officials want to see the completion of GO regional express rail along the Kitchener GO line expedited ahead of the 2024 target for 15-minute, two-way, all-day service between Bramalea and Union Station. It’s a plan that would help alleviate congestion issues along the corridor. This would include building a freight bypass rail corridor to free up capacity along the Kitchener GO line. At the same time, Brampton wants the MTO to consider putting a stop on the planned high- speed rail corridor within the city. Solutions to Brampton’s transit woes could cure many of the city’s ailments, including boosting jobs and investment and easing the crippling traffic. Creating a better transit network would attract investment in business and industry that would provide a much-needed boost to Brampton’s economy. An example is seen in Waterloo Region, where, following the approval of the Kitchener-Waterloo LRT, more than $2 billion of development occurred along the corridor between 2011 and 2015. In Brampton, the proposed LRT route was expected to have an economic impact of about $1.8 billion by 2031, thanks to the attractiveness of alternative modes of transit to GTHA developers. Business development would have the double-punch of knocking down Brampton’s sky-high tax rate by increasing the business tax-base and decreasing the burden on residential taxpayers. Healthier lifestyles, reduced greenhouse gas emissions, less stress on the road, more time with family, increased productivity — all of these are potential benefits of improving transit across Brampton. Many residents of the car-dominated city are already changing their attitudes to transit. In 2017, annual transit ridership increased to 27.4 million, 18.4 percent higher than the year before. But Brampton’s shift toward transit will be stifled if the province doesn’t get on board.